A tired joke for sure but hey, it’s early in the week. A friend of mine graciously donated this Old Glory ship to me when he moved back to the West Coast. I hung on to it as I have a scenario for the French and Indian War involving a docked French ship, and as Sharp Practice has rekindled my interest in the period, I decided to slap some paint on her. I do have the ship’s cannon, but as they aren’t needed for the scenario I put them away for the time being. Total impulse buy at Historicon, but when I saw this thing from Pulp Figures I “had” to have it. It’s already been put to use as a moveable deployment point in Sharp Practice. It’s a great sculpt. Everyone should have one, even if you don’t have a use for it. Well, carts really but I couldn’t think of any catchy cart reference. While at Historicon I participated in an interesting game titled “My Fair Demon Barber of the Opera: A Musical Celebration of Victorian Horror” (side note – the quote referenced in the linked blog from the Sweeney Todd player was from yours truly). Brigade Games sponsored the event and was kind enough to give all the players a coupon for 10% off at their booth. As part of my usual convention haul from Brigade, I picked up these cart kits from 4Ground. The second edition of Sharp Practice has a few carts that can be taken as support elements, and these fit the bill nicely. Nothing revolutionary here. Some quick assembly, paint jobs and basing and they’re ready to go. A few gamers at the store have been selling others on the merits of Army Painter Quickshade, so I decided to give it a try. I need a little more practice with it, but overall I’m fairly pleased. In general it won’t produce any award winning masterpieces, but it is great for getting “line troops” finished up. My first use was on these colonial settlers for Muskets & Tomahawks. They are a mix of Conquest and Old Glory figures. Not the best, but good enough for the tabletop. 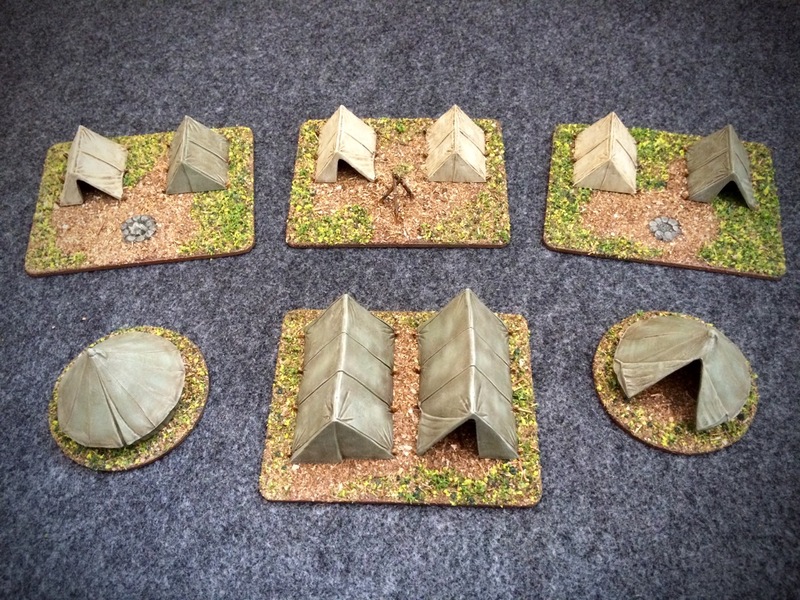 Quite some time ago I painted these tents from Renedra with the intent of using them in Pulp and 18th Century North American gaming. They’ve never seen a table, so I thought that if I mounted them maybe then I’d be more apt to use them as terrain pieces/objectives – we’ll see. I simply flocked some wooden discs and rectangles from the craft store for the bases. The campfires are from Renedra and I believe that the muskets are from Conquest Miniatures. Because of my recent obsession with Studio Tomahawk’s Muskets and Tomahawks rules, I have decided to knuckle down and complete all of my Colonial America projects before moving on to something else. I’ve been moving/storing/reorganizing this stuff for years, so I’d like to put it to use. I’ve started by doing a little touch-up work on existing terrain. Some of these pieces have appeared on this blog (and other failed ones) before, but I think that they’re worth a second look. These Woodland Indian long houses are some pre-paints from Conquest Miniatures that I bought on consignment. I repainted the blanket doors, dry brushed the exteriors to lighten them, and dry brushed the mossy flock with a yellow-green. These totems are from Grand Manner, and I bought these painted as well. I flocked the bases to better match the rest of my terrain. The following three pieces are all from Architects of War; a pigsty, family plot, and garden plot. I did some minor touch-ups on the paint jobs on all three. 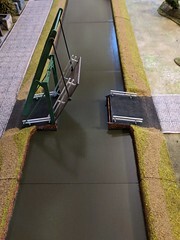 Renedra’s Ramshackle Barn received a removable roof, some new flocking on the base, and some green algea stains on the lower parts of the boards. 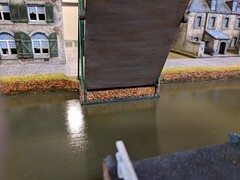 And finally I reworked Renedra’s pontoon bridge by creating “wakes” for the pontoons using Woodland Scenics Water Effects and did some additional dry brushing on the planks to add some color and wear.